Piece together history and reveal the headlines and photos from any meaningful day with this unique – and affordable – gift! Choose any important day – birthday, anniversary, retirement – and you’ll receive an exact replica of the New York Times front page from that day. The puzzle is available in 3 sizes – 500 piece, 1000 piece, or an easy-to-assemble 300 piece puzzle that features larger pieces – perfect for younger children! You’ll also receive a paper copy of the front page to view while assembling the puzzle in case you need a little extra help. 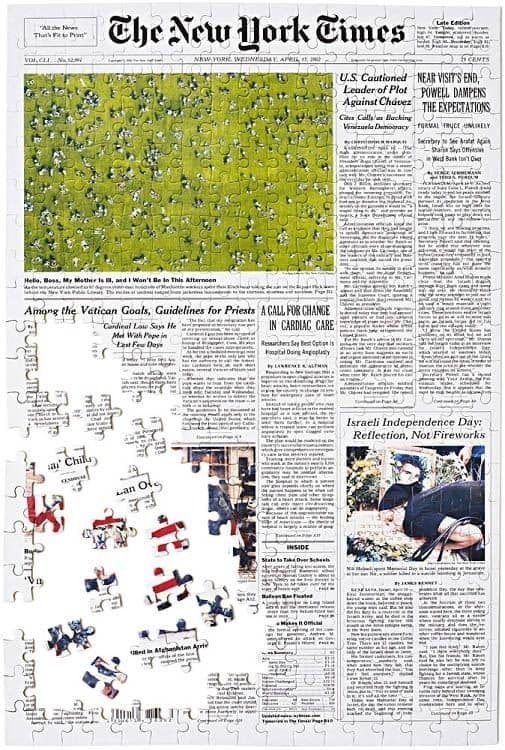 The puzzle is in black and white for dates prior to 1998; after 1998 it’s in full color. A thoughtful and fun gift to celebrate any milestone birthday or anniversary!